In this day and age, it's hard to imagine the United Nations being located anywhere but New York City. But how did it end up there in the first place? Who chose a US location? How many other places were considered? 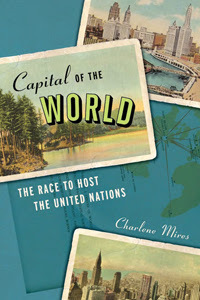 Charlene Mires' book, Capital of the World: The Race to Host the United Nations, takes an in-depth look at the competition between cities, suburbs, and towns around the US to become the permanent home of the United Nations. Much as cities and countries now compete to host the Olympics and or political conventions, they once competed to entice the United Nations into their backyards, showcasing civic pride, touting history, and highlighting natural beauty. Starting with the very birth of the United Nations Organization as the Second World War was winding down, Mires traces the politics, personal preferences, travel concerns, and various other considerations that played into the final decision of where to place the headquarters and which place in the US would be able to claim the title of "Capital of the World." The competitors for the honor ranged from cities like Philadelphia, Chicago, and San Francisco to suburbs around the country, from scenic areas like the Black Hills of South Dakota to US/Canada border towns like Sault Ste. Marie, MI and Niagara Falls, NY. Mires introduces readers to the biggest boosters from each area and chronicles the paths of their campaigns. While she details the excitement and possibilities being generated in each of these UN location hopefuls, she also takes readers into the committee rooms of the newly created UN where debate on the needs for a location were determined and then changed and changed again. She writes of the sometimes seemingly arbitrary reasons behind excluding otherwise suitable places and including other less than suitable locations. As a personal side note, I am selfishly glad that the UN didn't choose Sault Ste. Marie because if they had located themselves on Sugar Island, our annual summer family experience at Clyde's Drive-In wouldn't be the same. Burger joint aside, I can't for a minute imagine a UN complex in the area and found it fascinating to even try. In setting the stories of all these varied places together, Mires has drawn a pretty comprehensive portrait of the climate in the US in the immediate aftermath of the war. She has captured the patriotism and pride in community that was so prevalent, the overwhelming desire to support an organization that promised to prevent another all-encompassing war to which so many sacrificed sons, and the conviction that anyone and any place, large or small, could be a part of history. She's also presented the question of the UN's location in the larger framework of the political and social climate of the country at the time as well, facing housing shortages with veterans returning home, the need for employment opportunities for all these men, the racial tensions and codified discrimination of the time, and the fear of losing local sovereignty and perhaps more importantly, property and homes, to an international organization. This story of exactly how the UN found its home in New York City is quite comprehensive. Both people and places are introduced and explored in detail from the initial interest in hosting the UN to the tactics used to further their claims throughout the decision making period. The UN's waffling and uncertainty about exactly what would best serve their organization, a "capital of the world" city set apart from pre-existing cities or simply a headquarters building located within an existing infrastructure, is also explored in depth. Each of the back stories of place and people are intriguing and unknown to most readers (this one included). They can, at times, be a little over-detailed and in some cases are so similar as to make for occasionally repetitive reading. The struggles to define exactly what the UN was looking for showcases the continuing difficulties we see in the world when so many disparate countries and people try to come together as one. The included architectural renderings that many of the competing locations created were fascinating and explained how each community viewed the UN and its purpose. This history of a place we could never imagine elsewhere now and the original question of where to locate it is illustrative of the immense possibilities the country, and the world as a whole, faced in the late 1940s. History buffs and UN enthusiasts will find this an easy and fulfilling read although others might be a bit bogged down by the minutia. For more information about Charlene Mires and the book check out her university website, the publisher's website, or the book's blog. Follow the rest of the blog tour or look at the amazon reviews for others' thoughts and opinions on the book. Excellent review, Kristen, and very different than mine! Mires does draw a comprehensive portrait of America post WWII. I'm fascinated by the backstories of major events or locations, so this sounds like just my kind of book!